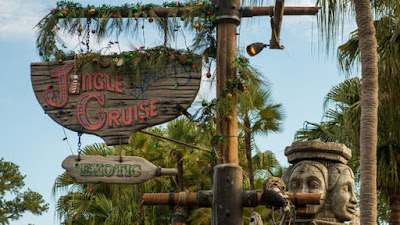 Guide4WDW.com: The Jingle Cruise Begins it's Holiday Run Today! Today, the classic Jingle Cruise returns to the Magic Kingdom! For those of you who may not know, the Jingle Cruise is a fairly new tradition at Walt Disney World. As a part of the holiday theming of the park, Disney carries over the holiday spirit onto the Jungle Cruise. As the classic attraction is decorated and prepared for the holidays, guests experience a subtle twist on the classic storyline. A few new jokes are thrown in, the atmosphere changes ever so slightly, and the experience becomes even more uniquely Disney. The simple "overlay" has become somewhat of a tradition for the Magic Kingdom. Guests truly love the time honored attraction's subtle variation and it truly puts you in the spirit of Christmas. Be sure to set sail on this attraction during your visit to the parks this holiday season! It's only available for a small portion of the year!